Before you decide which college you’ll attend, it’s important to understand where the money is coming from to pay for your college tuition, food, books, room and board, etc. Determine how much college will cost you by taking advantage of free online tools and calculators. You or your parents may have already started a college fund for you years ago, but do you really know how much college will cost you? 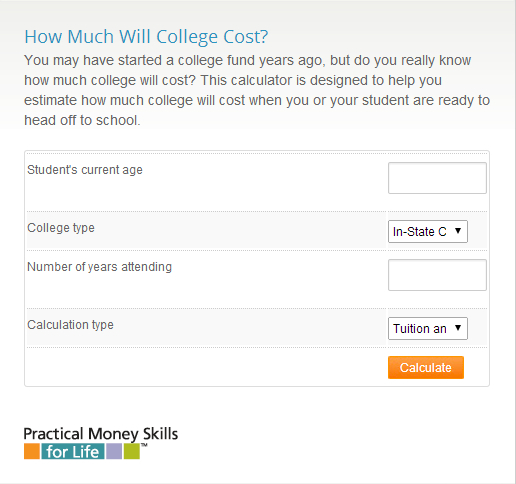 Our free calculator is designed to help you estimate how much college will cost when you are ready to head off to school. Going to college is a big life-changing decision, and it shouldn’t be taken lightly. College costs increase at about twice the inflation rate. Current increases have averaged around 5% to 8% per year, and Student Loan debt has recently surpassed credit card debt in the US. It’s important to do your research and learn the facts before you sign on that dotted line for that student loan. It’s a good idea to only borrow the amount you really need. Too many people borrow more than they actually need and then end up paying so much in fees and interest, or they have a very difficult time paying it back. As long as you’re thoroughly prepared and frugal, student debt can be helpful, some experts claim. Taking out a loan to help cover some of the costs of higher education is an investment in yourself and your future. When you’re shopping for a loan, you should not only look at the monthly payment that you will be required to make on the loan, but also the total amount of interest you will pay on the loan. This other free online calculator is a useful tool to help you compare different loan terms. The total cost of a loan is the actual money you borrow plus all of the interest you will pay along the way. Click here to use this free loan cost calculator. You should research your earning potential. For student loan debt to be manageable, the total amount you owe (including all interest) should be less than your starting salary after graduation. Forecasting for your future might seem hard, but researching the published salaries of recent graduates can pay off down the road. You should explore NerdWallet’s college comparison tool, which lists average starting salaries by major and college. However, not all schools report their data, so depending on what you pick, you may have to look elsewhere to try and figure things out. But it’s a great free tool to use and gain some knowledge from. College should be looked at as an investment, but you don’t want it to be a huge burden down the road because of too much student debt. Take the time to do some research, ask questions, and talk to recent graduates. Prepare yourself first, and you won’t have to worry about “what ifs” when you’re holding that diploma!